Employers have a myriad of human resources policies to comply with their wide-ranging obligations in employment law as well as industry and internal practices and procedures. Often these policies are bundled in what employers refer to as an “employee handbook”. This may be efficient, but can also be dozens if not hundreds of pages long. For key terms of employment like termination clauses, courts are increasingly finding that these policies must be included in a contract of employment and not buried an a lengthy employee handbook. Monkhouse Law represented an employee in just this situation in Asgari v. 975866 Ontario Ltd., 2015 ONSC 7508 (CanLII) where the court found that the handbook was not binding on the employee (to see our blogpost on Asgari click here). A similar situation was before the British Columbia court in Cheong v. Grand Pacific Travel & Trade (Canada) Corp., 2016 BCSC 1321 (CanLII), which is discussed in greater detail below. The Plaintiff, Cheong, was employed by the Defendant, Grand Pacific, for over ten years as a Director of Sales and Marketing. During this time, Grand Pacific introduced a staff Handbook and e-mailed all staff stating that within 7 days of reviewing the handbook, Grand Pacific will have deemed it is fully understood by staff and that they will observe and abide by the rules of the handbook. Cheong did not respond to the email, verbally or in writing. Cheong ended up resigning from her position after ten and a half years of service with Grand Pacific. Cheong was absent from Grand Pacific and working elsewhere for approximately a year because Grand Pacific approached her about returning to work for them. Cheong and Grand Pacific had several conversations regarding the conditions of her return to work, including her past tenure to be considered continuous and that all other aspects of her employment remain as it were when she was employed previously. Two and a half years after her return to Grand Pacific she was terminated without cause and provided with 2 weeks pay in lieu of notice. A week’s pay is the average wage earned in the last 8 weeks. In this case, the main issue at hand was whether the above-mentioned termination clause in the employee handbook was a binding term of Cheong’s employment with Grand Pacific and if it was, was it enforceable? The Court found that the handbook was not a binding term of Cheong’s employment for several reasons. First, there was no reference to the handbook when Cheong and Grand Pacific were negotiating the terms of her return to working for them and a copy of the handbook was never provided to Cheong upon her re-hire. Second, several provisions of the handbook were not followed in practice. Third, there was no agreement by either party to the terms of the handbook when Cheong became re-employed as it was not mentioned or referenced during the negotiation expressly. 1. 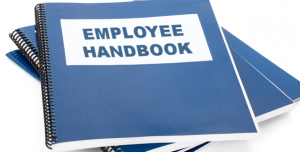 The handbook is referred to as setting out “comprehensive terms” for employees to “observe and abide” by and that it would be “deem[ed]” enforceable within 7 days. There is no express language by Grand Pacific to the employees that the terms of the handbook are mandatory and that if accepted by the employees, it would have contractual force. The language is conflicting on whether the handbook is a guideline for information or a hard policy. 2. There is no consideration that would be provided to the employees for their agreement to the change in terms of their employment by incorporating the handbook. 3. The introduction of the handbook states it was “designed to cover those employment conditions, rules and benefits that most often apply to our day-to-day activities and has been prepare to provide you with information and guidelines.” This indicates that the handbook was not intended by Grand Pacific to form a part of the contract of employment but rather be a guideline. 4. Several provisions of the handbook are drafted to indicated that the rules in the handbook are to be applied at the discretion of Grand Pacific rather than being binding. As a result, the handbook was not found to form a part of Cheong’s contract of employment and therefore could not be applied to restrict her entitlements upon termination and Cheong was awarded 14 months’ pay in lieu of notice for the termination of her employment. For a take away from this case, it is important to carefully examine your contract and handbook. If you are unsure if your handbook is considered binding on your employees, or if you are looking to have a contract or employee handbook drafted, contact Monkhouse Law today for a free 30-minute phone consultation to discuss your options.